The main key to understanding Scharf’s art is outer space and an interest in the cosmos. Kenny zeroes in on inner space at the molecular level – like atoms. Now as Kenny continues to make art, he uses selections from his growing iconography. Kenny Scharf is the funhouse grandad of street art. He moved to New York City in the late 1970s, took up with the early club kids in the Lower East Side and mashed up the visual worlds of Pop, New Wave, graffiti and the downtown art scene with his TV generation influenced art. Loopy goofy faces, swirling planets, cartoony creatures that went from smiling to grrrr took over his visual iconography. The main key to understanding Scharf’s art is outer space and an interest in the cosmos. Kenny zeroes in on inner space at the molecular level – like atoms. It’s then easy to recognize the spirals, stars and planets that make up this world, which is either outward- or inward-looking. As Kenny says, “I find it interesting that outer space and inner space are the same — the way planets revolve around the sun, much the same way electrons revolve around the protons of the nuclei.” Flipping through television channels is an apt metaphor for understanding this perspectives. He also has a thing for donuts which he paints incessantly and has piled high in towers at his art openings. Considering the flying saucer shape, funhouse colors and bizarre flavors donuts come in, the appeal is obvious. In the late 70s he first learned to use spray paint, and to master this newfound medium he recalls street art bombing the length of Manhattan between his studio in PS1 Queens and his home in the East Village, plastering the avenues with his colorful wacked out characters. Like his contemporaries Keith Haring who painted a radiant child, and Jean-Michel Basquiat (SAMO), who were both street tagging for years before getting into the gallery system, Kenny was inspired by graffiti’s freedom and the direct connection it gave him to people outside of the art world. His street smart art spirit and his belief that art should be for everyone continues with his wild selection for wall murals, decked out trailers, and custom decorated Cadillac cars and household appliances including toaster and refrigerators. Tony Goldman had known Scharf for decades from his East Village work and décor for various nightclubs and gallery installations he called Cosmic Caverns. His first commission was a large mural on the outer wall of the Wynwood Kitchen and Bar facing the main courtyard. Scharf proceeded to paint one of his signature wild style cartoon bubble character murals, with bright candy colors and kooky colored characters that roam and zoom and soar around the wall with freewheeling abandon. One huge snarling face centers the mural with a big red nose, mean green eyes and green pointed teeth. Maybe it represents some omnipotent force, an angry cartoon god that all the other characters swirling around him need to needle, poke, chomp on. They can’t be contained either as they trail off the edges and slide around the corners grinning all the while. It’s a signature piece that will probably remain for many years. So when Tony Goldman asked him to transform a vintage Airstream trailer for Wynwood, it was a natural extension of Kenny’s work. Inside the airstream trailer viewers are transported into a black-lit world floor to ceiling 360 degree world, where ordinary objects—and even the possessions of the trailer’s last inhabitant—are painted in eye-popping Day-Glo colors. With a dance soundtrack playing, it’s a time capsule from the artist’s original Cosmic Cavern and the days of disco. Created in late 2012 as a tribute to Goldman—the legendary neighborhood redeveloper who created the Wynwood Art District from decaying warehouses and storefronts in the mid 2000s—the Kenny Scarf Garden is a later addition to the Wynwood Walls  street art project. The trailer needed it’s own space so a whole leveled lot was converted into ‘Kennywood” Garden a few blocks south of the main Wynwood Walls complex, complete with wall murals, lush landscaping, a bronze fountain Scharf designed and Scharf’s own 1960s-style Airstream trailer, complete with Day-Glo interior. At a party during Art Basel Miami a few years ago in the garden, Scharf drew a design on a NY model singer named Edwige’s back which she later had tattooed on. The trailer was thumping with disco, the fountain was bubbling and for beverages whole coconuts were being hacked open and filled with rum to mix with the coconut water. Miami residents can often be seen tooling around in Scharf’s painted cars, which he did for artist friends and curators on their vans, SUV’s and Cadillacs. He has a mural on Hollywood Boulevard and is repped by the Frederic Snitzer Gallery in Miami, who moved out of Wynwood when the monthly art walks got too crazy, and now resides near Museum Row by the Perez Art Museum and new Science Museum. And now reside near Museum row by the Perez Art Museum and new Science Museum. He has exhibited internationally and at museums in Los Angeles and has an upcoming show at the Museum of Modern Art in NYC this fall on Club 57, the downtown 80s haunt he honed his art and performance work at. He lived in Miami for many years during the 90s, but his wanderlust and the call of the Los Angeles art world proved too strong so he decamped for there. Kenny Scharf is the funhouse granddad of street art. 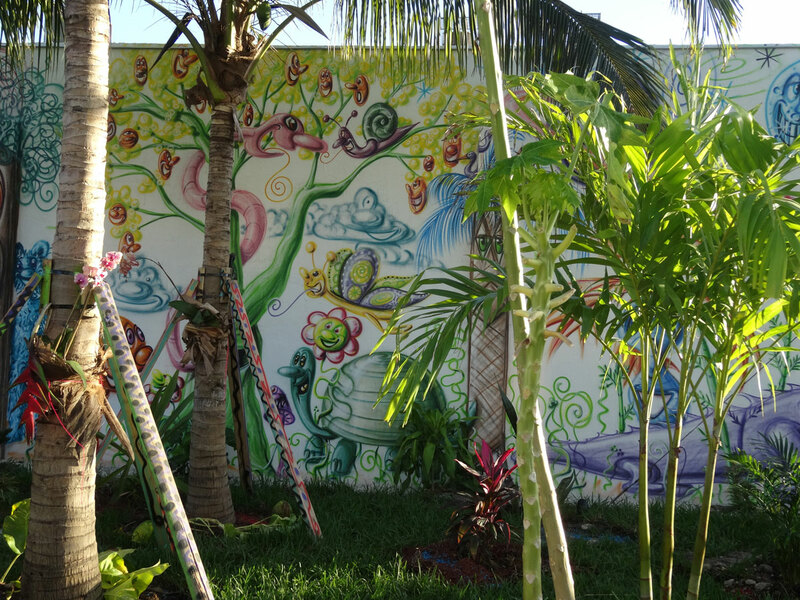 Learn about Kenny Scharf Mural and Garden at Wynwood Walls, linking it to his interest in the cosmos.